We created a Companion app for a piece of hardware that allowed users to listen to DAB, FM and internet radio as well as play the user’s own music library whilst they drive safely. UK Radio Player approached us with a new product idea. They had developed a prototype that could be fitted behind a car’s dashboard that could be controlled by a dedicated app on the driver’s smartphone. The device could receive DAB, FM and internet radio as well as play the user’s own music library, read out text messages and traffic alerts and enable hands free calling through the car speakers. We were asked to design an interface that would make all this technology simple and safe to use while driving. With laws around what you can do around while driving being understandably tight, we started with researching what drivers could and couldn’t do safely in a moving vehicle. Conventional car radios have the advantage of physical buttons that give the user tactile feedback. With this brief we had to actively discourage users from looking at the interface in order to use it. We designed and prototyped the app experience. This allowed us to test our interface in a car setting. We iterated on the design, one of these iterations saw us introduce sounds effects to improve feedback for the user after carrying out a positive action. We designed two contrasting colour modes for night and day. The app automatically adjusts it’s interface depending on light levels. This reduces distractions at night and increases the visibility during the day. The Car Adaptor is in the finishing stages, but if you want to find out more, watch the video with Michael Hill, UK Radio Player's Managing Director. Check out UK Radio Player’s website to find out more about the app and Car Adaptor. 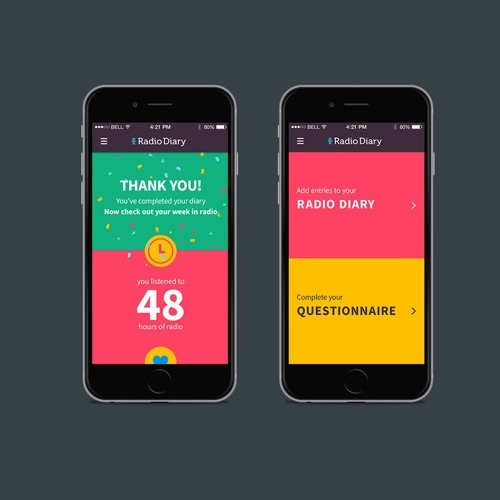 Data collection for radio still used pen and paper until we created an app for Rajar that encouraged people to shares their radio habits with through fun and interactive ways. Here’s to the future of radio!